These no bake caramel marshmallow krispie treats can be ready in 15 minutes and are sure to please a crowd! Like so many families, when I was growing up ours used to make massive numbers of cookies for the holiday season. I have the best memories of spending the day in the kitchen with my mom, sister and brother, making all kinds of treats to give out to neighbors, friends, and teachers. 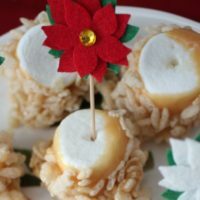 My favorite recipe was these No Bake Caramel Marshmallow Krispie Treats- they can be made in the microwave and they are so easy. I used to make one for each of my students when I was teaching- I remember a time when I made 180 in one night. Everyone has always loved them, and it thought it high time to share the recipe with all of you! This post was partially sponsored by Eagle Brand Sweetened Condensed Milk. Additionally, this post contains affiliate links that support Pura Vida Moms and no extra cost to you. These easy no bake caramel marshmallow krispie treats are gluten free, no bake and ready in 15 minutes. Sure to please any crowd- and a fun baking activity with young children. Unwrap caramels into a large microwave safe bowl. Add sweetened condensed milk and stick of butter. Microwave on high for 2 minutes, then stir. Continue to microwave on high in one minute increments, stirring after each minute, until the caramels, sweetened condensed milk and butter are thoroughly melted and combined. In a separate bowl, pour in abut 5 cups of Rice Krispies. 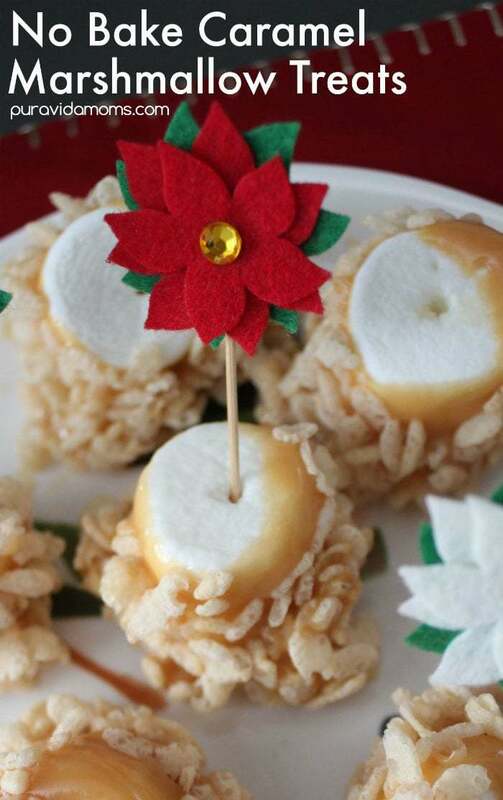 Lay out wax paper on a work surface with marshmallows, Rice Krispies and toothpicks. When the caramel sauce has melted, take a marshmallow and stick a toothpick into the top of the marshmallow. Dip it into the caramel and then the rice Krispies. Place on waxed paper to cool. Repeat until all the marshmallows are gone. Note: These treats do not store well in an air tight container- they get weird and don’t taste good. It’s better to store them in open air and eat them within 48 hours. What are your favorite no bake recipes? Let us know in the comments below! Looking for more delicious recipes from Pura Vida Moms? These easy treats are gluten free, no bake and ready in 15 minutes. 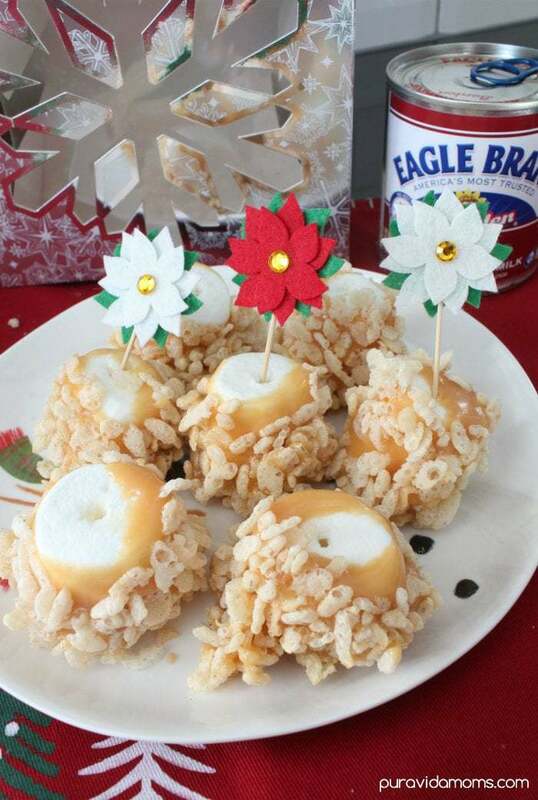 Sure to please any crowd- and a fun baking activity with young children. Note: These treats do not store well in an air tight container- they get weird and don't taste good. It's better to store them in open air and eat them within 48 hours.